The Yankees were within striking distance of the division lead in late-August 1993 and they turned to their young left hander Sterling Hitchock to keep it that way. Hitchcock responded by throwing seven scoreless and picking up the win, his first in the majors. "It's a lot of fun to look around, see the guys excited, and know the importance of what's going on here," Hitchcock told The Associated Press. "A win is a win, but a win in the middle of a pennant race - it's a great way to get your first one." Hitchcock would go on to get 73 other major league wins in a career that spanned 13 seasons. He would also get some of the biggest wins in San Diego's limited playoff history. Hitchcock's career began in 1989, taken by the Yankees in the ninth round of the draft out of Seffner High School in Florida. 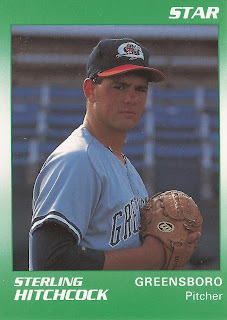 He played that first season in the rookie Gulf Coast League, going 9-1, with a 1.64 ERA. 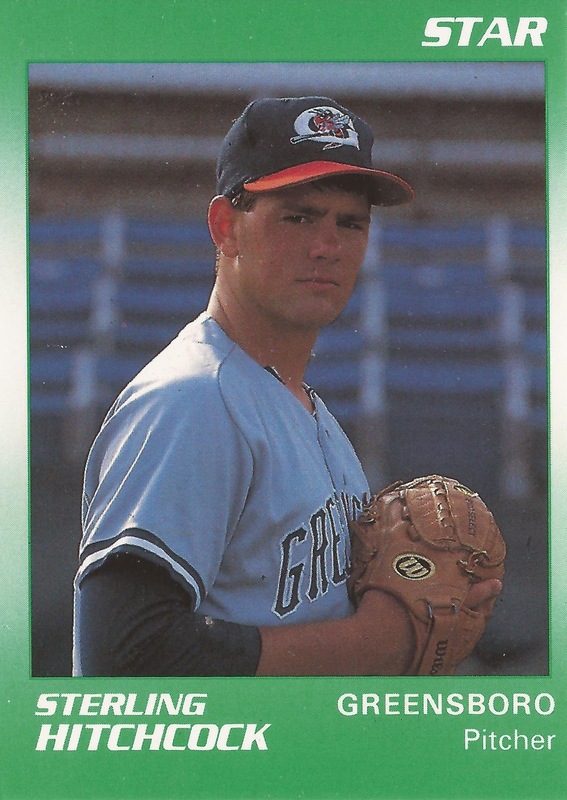 He moved to single-A Greensboro for 1990. He made AA Albany-Colonie by 1992. That September in 1992, Hitchcock also debuted in The Bronx. He started three games for the Yankees, going 0-2, with an 8.31 ERA. In his debut, though, he went six innings, giving up just one earned run and getting a no-decision. "I was impressed with his stuff," Yankees Manager Buck Showalter told The New York Times afterward. "He didn't seem in awe or intimidated by the situation. He could easily have come out of the outing without giving up any runs." Hitchcock got six starts, including that first win, in 1993. In 1994, Hitchcock got 23 outings while experimenting as a reliever. Over the next five seasons Hitchcock returned to starting. He also got no fewer than 27 starts in a season. In 1995, his last year with the Yankees, Hitchcock went 11-10, with a 4.70 ERA. Traded to the Mariners for 1996 in the Tino Martinez deal, Hitchcock went 13-9, with a 5.35 ERA. Hitchcock then got traded again, to the Padres. He went 10-11 in 1997, then 9-7 in 1998. But it was the 1998 post-season where Hitchcock made his name with the Padres. He picked up a win in the NLDS, then two in the NLCS. In the NLCS, Hitchcock pitched in 10 innings, giving up one earned run. He also won series MVP honors. "I can't explain it," Hitchcock told The AP as the Padres prepared for the World Series. "I was able to kick it up a notch with my intensity. It really isn't anything that I've done, but this whole team battling and playing well together." In the World Series, though, both Hitchcock and the Padres went without a win. Hitchcock, though, would get his World Series win three years later, back with the team that drafted him, the Yankees. Hitchcock picked up the win in Game 5 of the 2001 World Series. Hitchcock played in three more seasons, finishing in 2004 with the Padres again. Injuries, though, forced him out that September. "This is not the way you want to go out, obviously," Hitchcock told The AP after announcing his retirement. "There are very few who get to choose the way they want to go out."